After a full day of tours on Friday, I now knew what I was getting into. I woke up early, with no need for an alarm despite the many drinks the night before. I made sure I had a complete breakfast, some amazing eggs Benedict topped with crab, and some coffee, and away we went! We boarded our bus and headed out, with the first stop on our tour being a tasting at Heaven Hill. However, our tour guide, Wendy, had a surprise for us. Because we had some time before the tasting was to begin, we made an extra stop at the Jim Beam distillery! 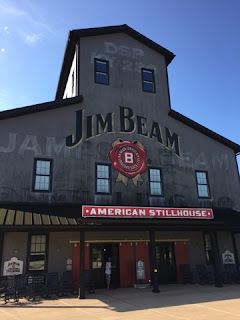 While we didn't get to do a tasting or a tour while there, it was still nice to get the extra stop and the opportunity to go stomping round the Jim Beam grounds, taking photos of the Jim Beam and Booker Noe statues, learning about the history of Jim Beam and their different products, checking out their rickhouses, and smelling the smoked meats coming from their smokehouse first thing in the morning! This was a nice added bonus to the tour. After about a half hour, we boarded our bus and headed on over to Heaven Hill where we were greeted and immediately ushered into their tasting room. It was a great set up, with high-top tables and chairs for everyone, and wine crackers and water already set out on the tables. The tasting lineup consisted of Elijah Craig and Larceny. With so many different offerings available, I had hoped for a little something more or different than their typical grocery store liquor shelf offerings, but it was an enjoyable experience nonetheless. At one point, though, I managed to strike up a conversation with an older tour guide, and he and I ended up talking for about 20 minutes about bourbon, our likes and dislikes, discontinued and hard-to-find bourbons and everything I enjoy about this "hobby." This was probably my favorite part of the Heaven Hill stop. I only wish I had gotten his name before I left. From there it was on to Maker's Mark. I must say, immediately upon entering the visitor center and looking out the back door I knew this was my favorite distillery visit, and it only got better from there. The campus is beautiful, the kind of place you'd go for a picnic with your family. Lots of well-maintained black and red buildings built around a small, winding creek and surrounded by big, beautiful trees and lush landscaping. The tour was great as well! The large fermenting room was one of my favorite experiences on this trip. The room is full of six gigantic wooden mash tuns with beer in varying stages of fermentation. Not only did we get to walk right up to the tanks but we were even encouraged to dip out finger into the mash and taste it (it was like sweet cereal)! The tour then finished with a tasting where we got to sample their white dog, regular Maker's, Maker's 46 and cask strength. Our tour guide even took sips with us, toasting with each sample! We then left the tasting through a smaller storage area with a glass ceiling. Behind the glass were all sorts of blown glass pieces which were backlit to make for a stunning sight! 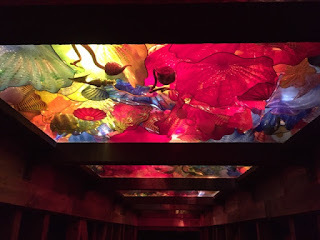 We passed under the colorful ceiling and into to the gift shop where we got to hand-dip our own bottles and where I picked up some Maker's 46 staves for grilling. The Maker's Mark distillery really had it all. It was visually appealing, inside and out. The tour was interactive, the tasting was fun and comprehensive, and even the gift shop was a unique experience. This tour was my favorite part of the whole trip! 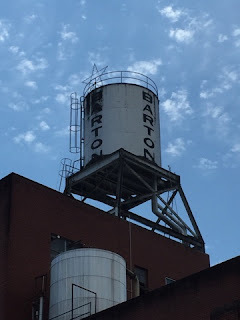 As our last stop we headed over to Barton 1792. The tour there was shorter in walking distance than all the others. This distillery offered its own unique experience, though. They take you right into the middle of their production plant. It's very industrial, and we were walking around and stepping over pipes and other equipment as we climbed to the third floor to see the top of the still. It was really a cool experience, as we felt like we were right in the middle of the production process. Plus, after a tasting of Very Old Barton and 1792 Small Batch, I was able to pick up a bottle of their newly released 1792 Single Barrel, which I cracked open as soon as I was back on the bus--very tasty! Our tour ended here, but these two days were very educational and incredibly fun! It's always a good time, though, when you're hanging around like-minded bourbon fans all day long, and Mint Julep Tours really did an amazing job taking care of us! That night I had some fried chicken, because I felt I had to at some point on this trip, and I enjoyed the heck out of a number of fine pours that are, quite frankly, pretty easy to find anywhere in Louisville--perhaps too easy judging by the amount I consumed that night and the way I felt that next morning. Luckily all I had to do was endure the 5 1/2 hour car ride home. I did finally get to the Haymarket, and there I finally got to try a pour of Rock Hill Farms, which I had been after since Day 1 of this trip. It was really a nice way to end the vacation (though we did walk across the foot bridge over the Ohio River before we left town on Sunday, but that's a lot like exercise and I'm therefore not considering that a part of the vacation).